Paul Romhany is one of the busiest working magicians out there. Not only is he in demand with his innovative Charlie Chaplin Act, but he also works private functions and parties with his close-up magic. This routine comes direct from his close-up act AND his cruise ship show. For a beautiful piece of magical close-up theater this is the routine for you. A well constructed and thought out Four Ace routine that offers some stunning visual effects. This updated DVD includes some new 'twists' Paul has added since the original release as well as the original Minuette Aces routine. This visual Four Ace Routine that has been a feature of his close-up AND his stage act on cruise ships throughout his professional career. Sit down with a deck of cards and some aces as Paul teaches you step by step his wonderful Minuette Ace routine. 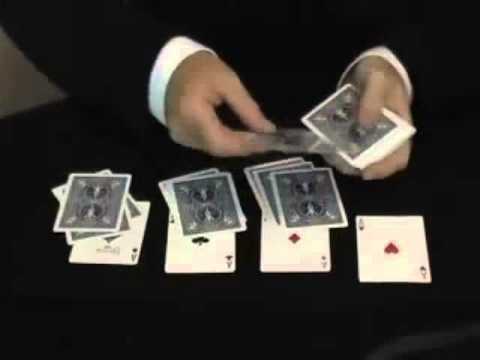 It is NOT just another card trick but a visual transformation where the aces visually appear, vanish, change and reappear making this a highly dramatic piece of theatrical close-up magic. Perform it as Paul does with a "music box" or as a speaking routine and you will have a professionally orchestrated routine that will become a feature of your own close-up show. Please note that this routine will require practice but once you master this you will end up with something you will be proud to perform in every show. For more magic by Paul Romhany click here.